with it's highly experience management, Aottam for integrated tourism services is planned to be number one in the business tourism field. Located in the center of Khartoum - Gamhoria Street - WadAlyas Building - Floor No (4), Apartment No (4), Aottam can ensure you a memorable visit. 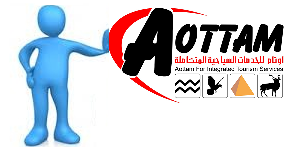 Aottam welcomes you in your country of Sudan and seeks to provide you with all the services of excellence in the field of tourism. Tourism purposeful, safe and enjoyable and comfortable travel benefits. Towards a Community mastered the language of tourism and penetrate the secrets of their incomes. 1. attract and bring tourist groups from groups and individuals to visit the tourist areas, especially the archaeological, historical and cultural areas and amateur Nile and marine tourism and safari and desert areas of fishing and tourism sights and imaging national reserves and the dispute and thus boost the national economy and improve the balance of payments. 2. Investment in the field of tourist accommodation and tourism services, and the processing and the establishment of camps and tourist camps mobile. 3. contributing to the development of tourism in Sudan, by providing means of convenient and suitable vehicles Land Cruiser tourist transport WABC father and yachts and boats river, sea and bicycles. 4. encourage tourist exchanges and educational visits, meetings and teaching languages and know the customs and traditions and folklore, and other similar activities among young people and university students with a view to putting them in the educational, cultural and sports activities, and attention to the knowledge and discovery and the search for an all-new, action to stimulate the cycling tourism. 5. contribute to increase the resources of the state of the direct and indirect fees that are achieved by multi-tourist activity of the company in fees visit archeological sites, museums and fees safaris and photography in national parks. 6. contribute to the creation of new job opportunities for citizens, helping to solve the problem of unemployment and reduce migration from rural areas to the cities. 7. contribute to tourism and raise environmental awareness among citizens, resulting in contributing to the preservation of the elements of the country's tourism. Sudan is the second largest country in Africa. Located in the North-Eastern side of Africa, covering an area of 1,882,000 square meters, Sudan is essentially a country of vast plains, interrupted by a few widely separated groups of hills and mountains such as Nuba mountain, south-west, and the Read Sea Hill in the East. The country is bordered by seven countries; Egypt and Libya from the North, Chad and central Africa from the West, the Democratic Republic of Congo, republic of South Sudan, Ethiopia, and Eriteria from the East.